When the weather gets warmer and the sun begins to shine, thoughts begin to turn to working plein air. However there are a few pointers which can make all the difference to what you achieve when drawing, sketching or painting plein air - and how you feel at the end of the day. 1. Impact on colours and tone #1 Sunshine makes it really difficult to evaluate colour and tone accurately. Your eyes need to be shaded. However you won't see any of the colours correctly if you wear sunglasses. Try wearing a visor (see right) rather than sunglasses - I find it works really well. 2. Impact on colours and tone #2 Your also need to keep your work out of the sun so that you can check and accurately assess the tones and colours you're using. I was astounded the very first time I took a painting out of the sunshine and put it in my room which was in shade - all the colours changed and nothing looked the way it did while outside. A white sun umbrella/parasol will help you to see colours better as you work. (However I've yet to find an art shop which sells white art parasols in this country! Might it be something to do with our weather?). 3. Impact on colours and tone #3 The colours you wear can also have an impact on your support if it's white or light in colour as it will pick up the reflected light of the colour of your clothing. Neutral colours can be very helpful. 4. Work out how the sun will move and the shadows change. It really helps if you know where you are in terms of the points of the compass. In the northern hemisphere, the sun rises in the east, moves south and sets in the west. So, before you start work out how the sun will move. I've been known to position myself to try and get the best shadows partway through my plein air working time. That's because when drawing in to get size and proportions correct it matters less what the sun is doing. What matters is when you move on to getting colour down. If you're not sure try asking somebody locally where the sun is in the afternoon. Creating a thumbnail sketch of the location of all the shadows before you start will also helo you to keep going as all the shadows start to change. 5. Do your homework beforehand. You can find scenes with great light and shade if you're prepared to put some time into doing your homework. If you see something that looks very striking but don't have your kit with you, make a note and come back on a day when the light is good and you've got everything you need. If you practice assessing light and how it moves, you can begin to work out what should be a great scene without ever having seen it. I've derived great delight in the past in making a journey with kit to a scene which lives up to my expectations! 7. Try working at the beginning and end of the day #1 You often get the most interesting light and the best shadows at the beginning and end of the day. The light is coloured. At midday the sunlight leaches colour out of what you see in front of you and produces scenes of great contrast. However the shadows move faster at the beginning and end of the day. 8. Try working at the beginning and end of the day #2 The other good reason for working at the beginning and end of the day on hot sunny days is that it's much easier to work when it's cooler. It's very difficult to focus and work well if you're too hot. You also need to make sure you avoid sunstroke. 9. Stay healthy - make sure you have access to water. Be near places where you can get a drink or take a bottle of water with you. If it's very hot you might not realise just how much water you are losing through perspiration. It's very easy to become dehydrated before you know it if you're focused on your painting. 10. Stay healthy - make sure you've packed your sunscreen. Even when sitting in the shade you can still burn from reflected light. 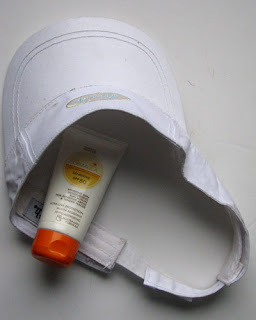 If you're not in the shade and you want avoid taking any risks with skin cancer then high factor sunscreen is essential. Make sure you put it on or top up away from the support you're working on otherwise you'll learn how to deal with a canvas or paper which has been sunscreened! I thought I'd finish with a few definitions of "plein air" for those who are unfamiliar with the term. French term meaning out of doors. Refers to practice of painting entire finished picture out of doors as opposed to simply making preparatory studies or sketches. Pioneered by Constable in Britain c.1813–17, then from c.1860 became fundamental to Impressionism. Important technical approach in development of Naturalism. Subsequently became extremely widespread and part of practice of Rural Naturalists for example. Sometimes taken to extremes e.g. by Stanhope Forbes of whom there exists a photograph of him painting on a beach in high wind with canvas and easel secured by guy ropes. en plein air (pr. ə pləh-nayr) - French for "in the open air,"
used chiefly to describe paintings that have been executed outdoors, rather than in the studio. Plein air painting was taken up by the English painters Richard Parks Bonington (1802-1828) and John Constable (1776-1837), and the French Barbizon School, and it became central to Impressionism. Its popularity was aided by the development of easily portable painting equipment and materials, including paints sold in tubes. The equivalent term in Italian is "alfresco," which is also used by English-speakers. 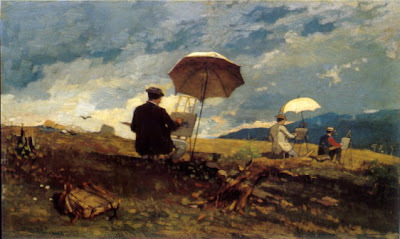 The term ‘en plein air’ refers to the practice of painting out of doors, in direct engagement with nature, where the transitory effects of light can be observed and recorded. It has a history in Europe of several hundred years, the most famous exponents including Salvator Rosa and Claude Lorraine in the 17th c. and Corot and the Barbizon school painters in the 19th. In an Australian context, the Impressionists of the late 19th century, including Arthur Streeton and Tom Roberts were devoted to painting out of doors, and thus brought a new understanding of Australian light and landscape to the public, through their work. Fred Williams, Australia’s great master of landscape painting in the twentieth century, used studies painted out of doors as the foundation of his work. These artists and others established a strong tradition of painting ‘en plein air’ in Australia that continues to this day. You can see a catalogue of selected works from the 2009 Plein Air Painting Prize awarded by the New South wales Pariliament on the web (pdf file). Wow, great tips! I will be attending a plein air workshop this weekend and this is going to be a big help! Thank you! Thank you for these tips!!! I painted the New Mexico sunlit hills, and I was in the shade in a picnic shelter. I found it extremely hard to pick the right colors and when I got home realized how really far off base I was. Everything was completely washed out. I'll try your tips on my next outing. Thanks so much!!!!! This is a great post. Going to France shortly and wondered how to paint in the heat. Thankyou.